When framing a window into a wall it is important that the rough window opening be sized correctly. If the rough window opening is too small the window will not fit into it, and if it is too large there will be wide gaps that will make it difficult for the window to be hung properly. This can also lead to poor insulation and air infiltration causing a drafty room. Consequently it is extremely import when framing a window to get it right. Check out this eBook on how to frame out a window. Typically when framing a window the rough opening for a wood window frame should be sized 2 inches wider and 2 inches higher than the window itself. For example, a 30 inch wide, by 36 inch high wood window, would require a rough opening width of 32 inches and a height of 38 inches. This sized rough opening will allow for the window frame to be installed with about 1 inch of play on both sides, and 1 inch on both top and bottom. How to Install a New Window eBook. This spare space will allow for the window frame to be leveled and plumbed so that it operates correctly. Note that when installing the window frame shims and blocking should be used to plumb and level the window frame. The shims and blocking should be wedged in between the window frame and the wall studs that form the rough opening. Find a local window installation contractor here. This will help to prevent flexing of the window and ensure that it continues to operate correctly over time. When framing windows for Aluminum and Vinyl windows, manufacturers typically undersize the windows and thus require the rough opening to be the same width and height as the advertised window. For example, in the 30”x36” window mentioned earlier, the actual rough opening would be 30” x 36”. 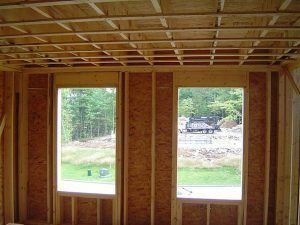 Note that these framing out a window guidelines are typical framing window standards that are employed in the home construction business. You should always check with the manufacturer or product specifications to confirm the rough opening requirements for your particular window. 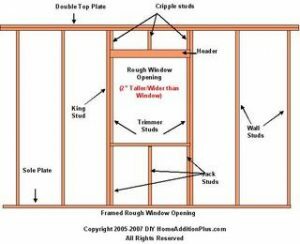 Check out this eBook on How to Install and frame a Window. Need to install interior window trim? 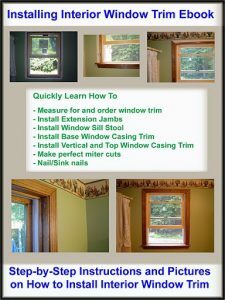 See HomeAdditionPlus.com’s eBook on Installing Interior Window Trim. 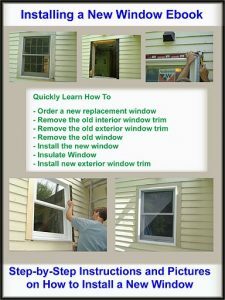 The Installing Interior Window Trim eBook provides easy to understand, step-by-step instructions, on how to install interior window trim, and pictures are included for every key step in the process!